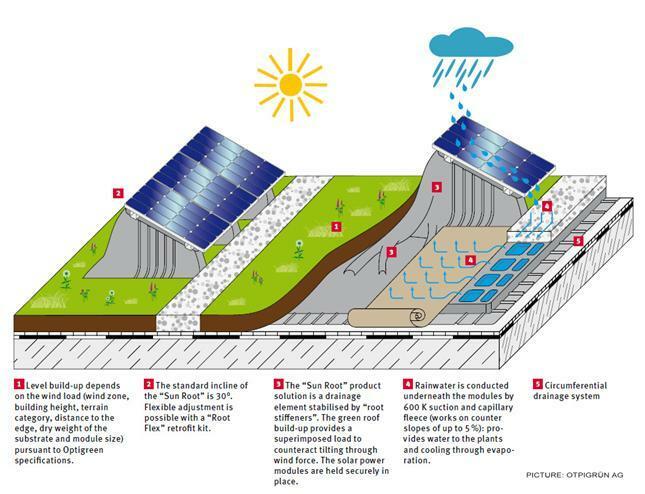 Both green roofs and solar panels have their own set of unique benefits that make them well worth considering on their own, but these green technologies can also work together. Green roofs have been used for many decades and benefits including absorption of rainwater, improved insulation, mitigation of the heat island effect and many others which are well documented. A study conducted at the University of Michigan (Green roof valuation: a probabilistic economic analysis of environmental benefits) found that a 21,000-square-foot (1,950 m2) green roof brought in about $200,000 in savings over the course of it`s lifetime (compared to a conventional roof). Almost two thirds of these savings came from lower energy consumption. One of the best things about green roofs is that the plants lower surrounding air temperatures- which is great because photovoltaic solar panels perform better when cooled. Another component is that green roofs remove pollutants from the air, which at the same time keep dust particles away from the solar cells. This will not only make maintenance easier, but also allow the solar panels to absorb more sunlight. Several research teams across the globe have therefore started projects to assess exactly how much of a performance boost can be achieved by combining the two. According to our sister site CleanTechnica, “solar panels mounted on a green roof will produce significantly more energy – up to 16% more – than those mounted on a non-living roof, especially during summer’s higher temperatures.” Another experiment by Bronx Design & Construction Academy found that the efficiency boost is about three percent (check out their blog to learn more about their project). integrated solar and green roof can be functional and beautiful! Although the results from these experiments are very different, both illustrate that there are benefits to combining solar and green roofs. A couple of percentages can make a lot of difference in the solar power industry, which in the long run will bring solar panels cost down and make green energy accessible to more people.